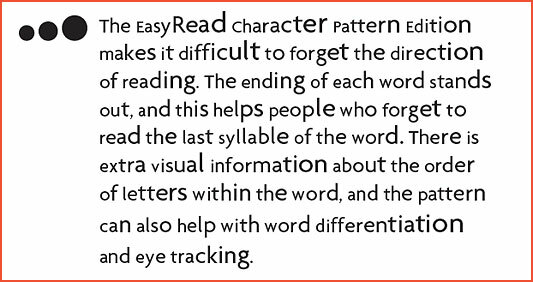 Lifted from the New York Times book blog, this is a really interesting post about a new company that is making reading easier for people with vision impairment, dyslexia, etc. Publishers Weekly has a fascinating article this week about large print books, and it seems that size isn’t all that matters anymore. PW reports on a new company, Read How You Want, that issues not only large print editions of books but also more unique volumes that serve a range of readers with special disabilities – things like eye-tracking problems, dyslexia and other reading impediments. Read How You Want plays with things like line spacing and highlights or enlarges words or certain parts of words to create editions of books in many fascinating formats, like the one you see below. This link will take you to a PDF that explains a lot more. While I’m interested in the character pattern pictured above, it does remind me of that Valley Girl speech quirk – you know, the one where every sentence seems to, like, rise and end in a question? I see what you mean about the text reading like an odd speech pattern, but it really did seem like it could help. I found the different sizes made my eyes move more quickly across the page, and it certainly should keep kids who only read the first few letters of a word around to finish the whole thing. Very interesting. I have the same problem, of not finishing reading the work before skipping onto the word, sometimes straight to the next line! This is a good way to keep reading focused.